Beyersbergen Interiors Ltd. Commercial and retail interior specialists since 1972. Beyersbergen Interiors Ltd. specializes in commercial and retail interior contracting and millwork manufacturing. 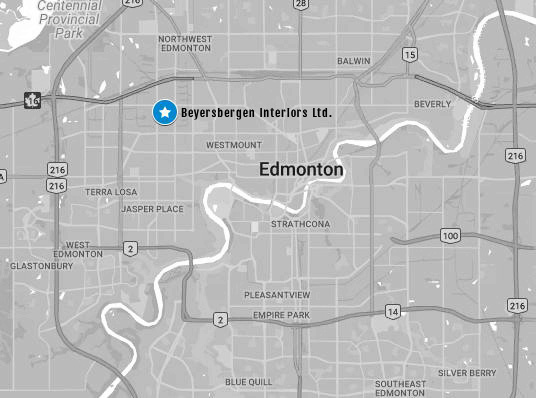 Our corporate office and manufacturing plant is located in Edmonton, AB, and we manage projects throughout British Columbia, Alberta, Saskatchewan, Manitoba, the Northwest Territories, and the Yukon. In 2017, Beyersbergen Interiors Ltd built over 100 stores and our annual construction volume was $16.5 million. We continue to be a leader in commercial interior contracting in Western Canada. Interior contracting is our bread and butter. From standalone retail stores and restaurants to ones within malls and commercial centres, we've been the people behind your favourite store for years. We offer a complete millwork package for our interior contracting clients. We manufacture all custom architectural millwork items, moldings, trims, complete with shop finishing as specified. We've been in business for over 45 years. This is largely due to our people. Great people mean professional service, and the reuptation that comes with it. We completed work on this standalone Edo Japan in North Town Centre in 2018. It is a shining example of a fresh look for an evolving brand. We were glad to be a part of it.